The death of a dog that ate a cupcake that contains a sugar substitute known as xylitol has prompted officials with the city of Alameda to issue an alert about the sweetener. City officials said that on Monday, Benny, a two-year-old dog, ate a cupcake containing xylitol that his owners had left in their compost and passed away. Alameda officials said Benny's family is heartbroken and wants to make sure that other dog owners are aware of the dangers of the sweetener, which they described as poison. The city said that according to the U.S. Food and Drug Administration, when dogs eat something that contains xylitol it gets absorbed more quickly into the bloodstream and may result in a potent release of insulin from the pancreas, which can be life-threatening. City officials said xylitol is a sugar substitute that can be found in products including gum, chocolate, mints, baked goods, cough syrup,vitamins, mouthwash and toothpaste. Dr. Michael Miller at the Providence Veterinary Hospital & Clinic in Alameda said, "Keep a close eye on ingredient lists of household products. he sugar substitute xylitol is extremely toxic to dogs and is being added to a longer and longer list of products, including chewing gum, breath mints, peanut butter and even nasal sprays." 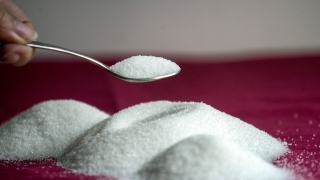 Miller said, "It's best to avoid xylitol completely and use other sugar substitutes. If you cannot avoid using products containing xylitol, then make absolutely sure they are stored safely out of reach of your pets." According to the FDA, symptoms of xylitol poisoning in dogs include vomiting, followed by symptoms associated with the sudden lowering of a dog's blood sugar, such as decreased activity, weakness, staggering, lack of coordination, collapse and seizures. FDA officials said dog owners who think their dogs have eaten xylitol should take them to their vet or an emergency animal hospital immediately.